Authorities blamed a sifted cargo caused by a sudden turn for the capsizing and sinking of the 479-foot-long ferry Sewol and the deaths of 303 passengers off the South Korean coast on April 16, 2014. Many of the dead were students and teachers from the Danwon High School, near Seoul, who were on the voyage from Hanja to Jeju, a popular tourist spot. Two civilian divers, who were searching for bodies in the sunken wreck, later were killed. Also the school vice principal committed suicide over the incident. There were 339 students and teachers among the 476 passengers and crew members on the ship at the time of the disaster. The 20-year-old Japanese built ferry was sold to the Chonghaejin Marine Company of South Korea in 2012. At that time extra passenger cabins were added on the third, fourth and fifth decks, raising the level of the superstructure. The ship was making three round-trips a week between Incheon and Jeju, and was on a routine voyage at the time of the sinking. The ship’s master, Captain Lee Joon-seok, was in his cabin when the third mate was at the helm when the ship made what was described as an "unreasonably sudden turn" to starboard at about 8:48 a.m. At that time the passengers said they heard a loud bang below deck and the ship began taking on water and listing to port. The passengers were reportedly first told to remain below deck and in their cabins instead of going through the launching of life boats to abandon ship. In the meantime, officers of the ship called the Jeju Coast Guard for assistance, and asked for other vessels in the area to help. 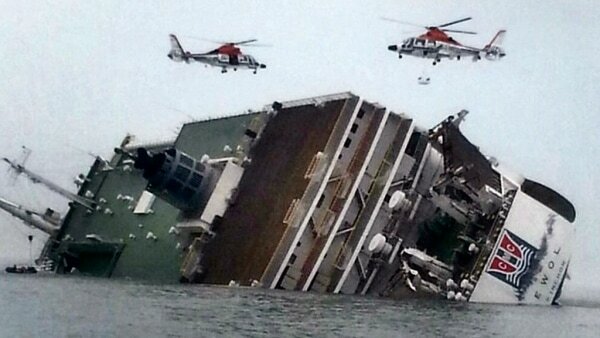 The Sewol tipped on its side and sank before that help arrived. The captain and first officers were among the first to abandon the sinking ship. Other passengers, who ignored the order to remain below deck, jumped overboard and consequently were picked up by the Coast Guard. It was later learned that in addition to the passengers, the Sewol was carrying 3,608 tons of cargo, three times the limit of 987 tons. To make the ship even more unstable, the crew reportedly pumped hundreds of tons of water from the ballast tanks to accommodate the extra cargo. This made the vessel extremely top heavy. Captain Joon-seok was arrested and charged with negligence of duty, violation of maritime law and other charges. The First Make Kang Won-sik, Second Mate Kim Y oung-ho, Chief Engineer Park Gi-ho, the ship’s helmsman and the third mate were all charged with negligence and manslaughter. Eventually 12 additional arrests of crew members who abandoned the sinking ship and violated ship safety laws were made. Kim Han-sik, chief executive for Chonghaejin Marine Company, the ship's owner, was charged with professional negligence leading to accidental homicide. Four other company officials were charged, as was Yoo Byung-eun, former company chairman. The company's license to operate ferries on the Incheon-Jeju Island route was cancelled. South Korean Prime Minister Chung Hong Won resigned because of what he felt was a failure by his government to properly handle the disaster. Three crew members, identified as Park Ji-Young, Jeong Hyun-seon and Kim Ki-woong, who remained aboard the ferry to help passengers escape, but went down with the ship, were given special commendation for their bravery. The ferry was operated under the name Naminoue following its launch in Japan in 1994. It operated for 18 years without incident before being sold to its Korean owners.